The Malaysian way is not “eat to live” but “live to eat”. 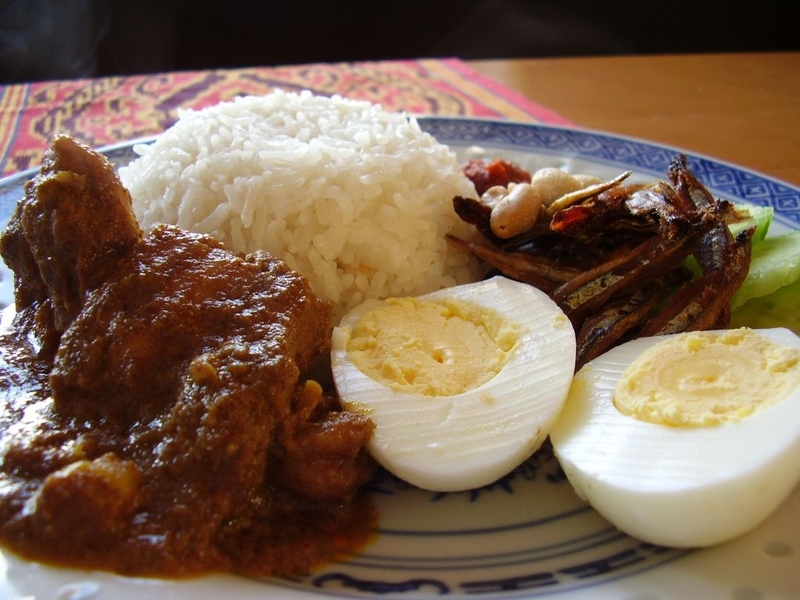 This dish is “Nasi Lemak” (means “Creamy Rice or Oily Rice” in Malay, the rice is cooked in coconut milk). Nasi Lemak is often sold in small parcels, wrapped in banana leaf, suitable for breakfast or a snack. The classic Nasi Lemak consists of coconut rice, fried “Ikan Bilis” (small dried sardines), fried peanuts, hard boiled egg, slices of cucumber and hot chilli sambal. Recipe in the cookbook “Blame it on Granny” of course! You can also find the recipe here on the site.